Ah, I am so into the holidays this year. Why fight it, I say. Embrace the Christmas lights for sale in August. There is a nip in the air (even in LA). Time to heat up the coco, make some cookies and shop online. Like our grandparents did. Well, guess we have to make our own traditions. Like sending out a cute photo card. Here is a new twist on that. Everything is better with sprinkles. I don’t know why, my sound came out so much worse than Dana or Jessica’s. In a nutshell, this is about Jessica being irked by the forced community service her daughter’s school has that creates more work for her. It’s funny that the three here all have chosen different educational paths. My daughter goes to public school, Jessica’s go to private school and Dana home schools. What do you think? Have you encountered this issue at your school? I think there is a list of this and that a school asks you to do and sometimes I’m all for it and other times I sit it out. Like the Cultural day planned smack dab in the middle of the holidays on a day I already have plans, I’m not jumping in on that one. But, hey look at my landscaping! And I need to add my extra mic. no, not the clap, I’m not a sailor! That Stomach Thing. This was before Thanksgiving. ( thanks had a nice, one,you? ) I knew I was dead woman walking when I heard a couple of months ago at drop off some mom’s talking loudly about their emissions. Censor something people! I quickly went into my head, “don’t get, don’t get”. It worked for many weeks. But after marching through our house it finally camped on my body for the longest of all. Now, most people incorrectly call it Stomach Flu. This is a misnomer as Flu is INFLUENZA something distinct and different. I prefer to call what I had as Intestinal Jihad, or in the common parlance of modern marketing, IJ. So the IJ hit on Mark’s bday night. The next day was a special outing I had planned A private, historical and architectural tour by the LA Conservancy with friends and family and then end up at a delicious lunch. Fun, original, an adult field trip. One of those things you always mean to do in your hometown, but never do. Mark being a history guy and a 4th generation Angeleno I knew he would love it. I knew I would love it. But, me, the gal who hates to miss a good time had to settle for emailed pictures from my sister of the day. 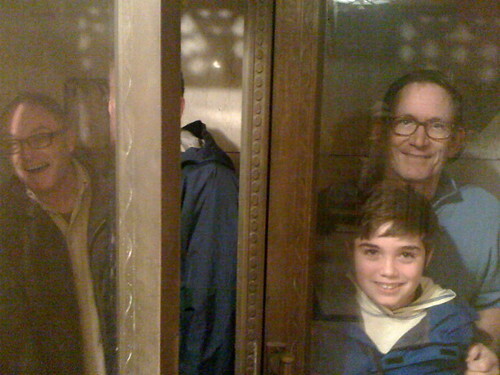 Mark, my brother in law Kevin, nephew Charlie in Mark’s favorite elevator of the day. 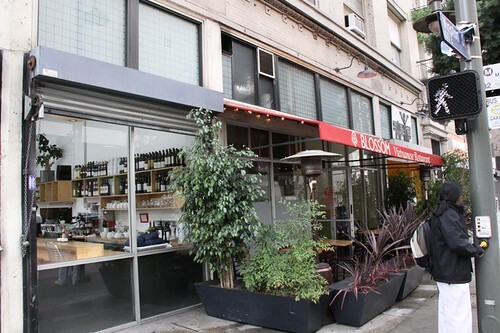 Downtown LA has- finally- gone through some gentrification. Some of the buildings they toured have been repurposed as other things from their former glory days and others have not. Which means cool lofts and the smell of pee depending upon what block you are on, or right near each other. 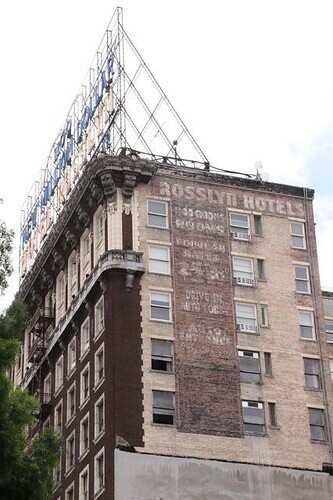 Sidebar, during the real estate boom I inquired about buying a loft in the Toy Lofts ( an old toy factory). I asked, “does it smell like urine around there?” I heard through a friend of friend that worked for the developer that this so pissed him off ( pun intended) that he wouldn’t even send me information on it. I probably would have lost a ton of money, so thanks Mister Sensitive pants. They all said the tour was fascinating. Meanwhile, I was daydreaming of sucking an ice cube. But, I knew I was missed. I was going to do trivia games over our meal and without me there were none. But, so glad MP had a fun day. Not displeased the IJ took 4 pounds from me. Unfortunately, after a few days it was all back. Water weight? Maybe it’s better to dress like Zsa Zsa Gabor when changing a diaper? I’m trying something new this year. For the first time ever Cool Mom will be a direct portal of sales through it’s vlogs. Or vlog rather, I only have this one here. And it’s not extensive product it’s one cutio cocktail ring ( well, a bangle as well). I think I’m like other mom’s as well in that a large portion of my shopping has become online, after the kids are asleep and I’m surfing around. Hopefully, for something I wouldn’t find in a store and at a good price. I learned about Open Sky months back. Open Sky is a way for small merchants to connect with buyers through blogs. With no marketing or merchandising budget it’s one of the few ways they can get their goods to the market place. Like other people online I struggle with the “how do I monetize this?” while “keeping my voice” and cred issue. This is not a product review site-which would be perfect for Open Sky. I waited until I saw a product that is available on Open Sky that I really loved. Of course it also has to be something that I can weave into a humorous video about the daily life of a parent. So, I stumbled upon this beautiful ring online by Roberta Chiarella. She has lovely costume jewelery that is fun, classy, great price points and rarest of all! MADE in the USA… well at least the ring is. I love a cocktail ring. Even a simple outfit can be elevated when wearing a cocktail ring. When I told them how much I loved this ring she set it up so Cool Mom buyers would have a steep discount on this fab bauble. From $60 to $28. Yes, coolmom does get a little commission if people buy the ring or some of the other pretty things in my “marketplace“. But, it’s not a lot and I was more into the virtual trunk show/ flea market, small business aspect to this then anything else. So, check it out. It is Cyber Monday, it is the Holiday time and it’s also nice to treat yourself. It is returnable, as well. Watch the vid for fun and if you like what you see and want to give it to yourself or some gal you know go to the links here. So, enjoy the vid and happy shopping. Not sure of ring size? Click here. The problem with trying to lose weight, learn a new language, playing the violin is that it actually takes a lot of time and discipline. One doesn’t see immediate results and let’s face it we are an instant gratification society. I decided that what was missing from my workout regiment was a montage. The all time BEST montage is from Rocky 3 ( my favorite Rocky) where Apollo Creed helps his former advesary get in shape for a new opponent. It was thrilling when I saw it in the theaters when it came out and it’s still great. Sidebar, Carl Weathers once came into a deli I worked at in college and was such a doll. I loved him. So, watch my montage, then Rocky and then create your own! Well, I’m a bit of a rambler here, so I don’t need to add much to this intro. Except that I think I should start marketing a line of t-shirts for kids with realistic slogan’s to combat the “My Dad is my hero” type or the “budding genius” variety. Perhaps, “My Dad is spotty on his child support” or “Mom can be nice, but kind of emasculates my dad in front of us.” That’s long. Might need to be a turtle neck. Seeing how our economy is going how about, “future vocational trainee” or “I wish I could get a county job”, “leave donations for college here” and it would come with a big pocket. Oh, crap, someone’s going to steal my idea. I am very pro let them dress how they want. Unless it’s a special event, then I want them to look like they just entered the Kennedy White House in 1962. Please tell me I’m not the only one who realizes their intellectual inferiority as their child gets older. By older, I mean 5! I can remember when I was little thinking my mom knew EVERYTHING. But, she told me, starting at about 11, “your kids will say, ‘you are stupid. '” I’m sure that couldn’t have been me! Oh, god, if only I could get to 11. (And yes, Vivien was in school while this was shot… so I used a stunt child voice). Sponsored Content: My Points, My Choice! Let’s not kid ourselves, holiday time has arrived and is sitting in our laps. If you don’t get going on this your leg will fall asleep. Here is a way to knock off a few on the list. Frankly, I think this video is adorable. Maybe it’s the old time music or maybe that it’s me and my sister Carole hanging out. Carole’s super hero power is her enthusiasm for things. If I tell her about a new job or a new pair of shoes she is excited and on board. “Personality Plus” as she calls it. As in, “Daph, that girl wasn’t that much fun, but you know I like people like us, Personality Plus.” So, while this is a sponsored video the setting of me and my sister sharing something we have discovered is geniune. Also, when Oliver opens a Coke I say, “keep the tops for my coke rewards”. Can’t say I haven’t thrown myself into volunteering at our public school. 4) her school started right after my dad’s memorial and I found being busy, with a purpose helped me feel better. 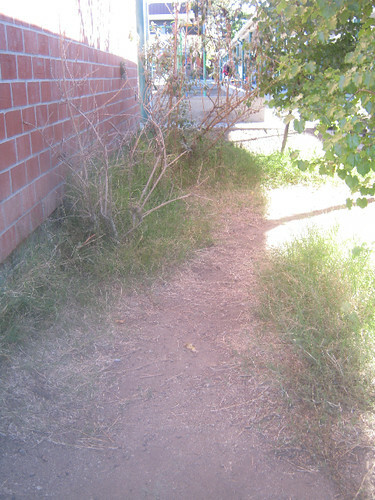 5) because I want her school to be prettier than my public school was–wouldn’t take much. 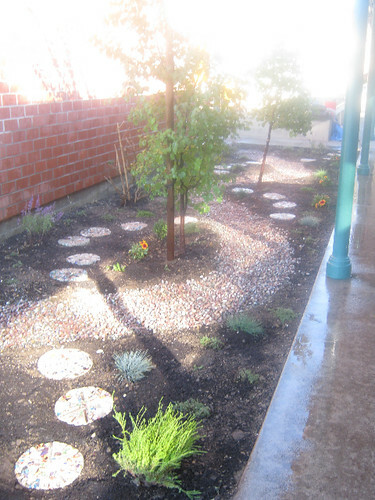 So, I just successfully completed heading up a landscaping project at her school. I’m sure you know that California is now near the bottom of US states (47) when it comes to funding public education. So, there certainly is no beautification budget. One are near my daughter’s classroom was bugging me. This part of the yard looked pretty sad. Some dead plants, dirt, water pooled in ruts after the rain. It took a little investigating to figure out the culture, who do I talk to ? Who do I get permission from? Who are the allies I need to get onboard? I also am fortunate to have an old friend, Larry, who is a great landscape gardener. He came and consulted and wrote up a design for me, suggested plants, helped me get them at a lower cost and got me a couple of workers to till the soil. Since there is no irrigation we had to pick plants that need minimal water, which are not usually the most colorful. So I decided that some fo the kids should make mosaic stepping stones to create color and a playscape. 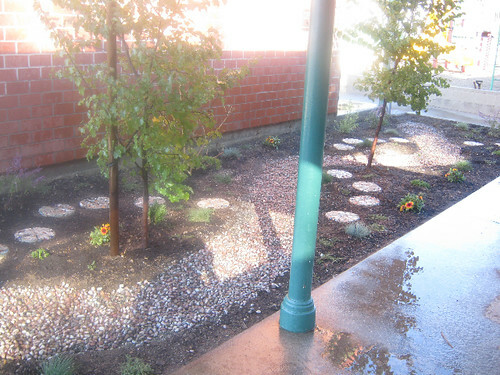 Larry suggested adding a rock river bed. It would help with the drainage problem the area has. Our art teacher was enthusiastic about the project. So two mornings Mark and I were stirring concrete in a plastic pan on the ground under the hot sun while poor Rex ambled around. First happily, then with a look of “are we every going home? It’s nap time people”. While 5 and 6 year olds showed up in groups and the art teacher, and I explained the process. Get in a team, create a design, place the broken china, flat marbles, broken tiles (side bar, hard to buy broken tile. Just buy tile and break it, live and learn), sea shells and beads. Then we poured, hmm, well, not poured, more like spooned the concrete over it. I used 12 inch planter saucers as the form and they worked out very well. The stepping stones popped right out the day after they were made. In order to cut down on the expense,which we bore for the most part ( not because people aren’t givers, but I really only asked one family, who did give generously. I felt bashful about asking people especially as I know people are at different levels of prosperity) I asked for volunteers to do the install. I booked a gig the day of the install so Mark was in charge of that great group of parents. I felt like I was missing Christmas morning. The next day when I dropped off Vivien I raced to see the new landscaping. If there is one thing I love it’s before and afters. What a difference. Kids were jumping from stepping stone, to stepping stone. The rock river bed proved more costly than we had anticipated. It’s 1,500 pounds of rock. Mark and a few other parents did all of that. The children like to run in it as well. Which is cool, but I worry a little about the design being corrupted. I was out with a rake trying to keep order the other day. Yes, probably futile and I suppose it should evolve and be useful to the students. But, it’s amazing how much more they interact with that space then they did in it’s old form. One of my CORE beliefs is that aesthetics and architecture make a great deal of difference in the life and education of a child. I know the junior high and high school I went was, physically awful. It was depressing. When I started in broadcasting it was around the time of the LA riots.I went back to my old school which now had a lot of students who lived in South Central. I interviewed some of them. They conceded that yes, probably stupid to burn down your old neighborhood. These were smart kids, none of them had partaken in that destruction, yet, they understood it and helped me to understand it. I want my daughter and other kids of Los Angeles to want to be in their school. To feel respected. Which means I’m now the Chair of the Landscape Committee. Cool, Landscape Mom. It’s only happened once. But, both of my kids spent the night away from home without me. Their regular babysitter took them to her apartment. It was a big exciting adventure for them and I was excited about a solid night of sleep. Yet, I don’t know if I maximized the time.